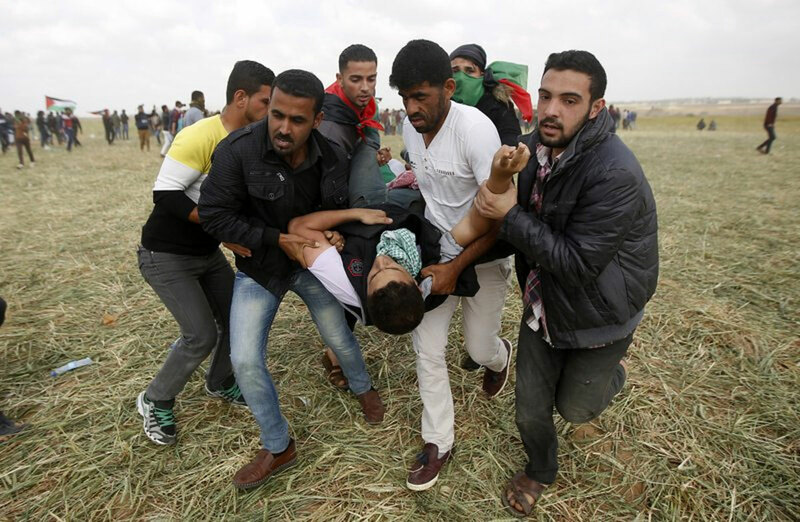 Thousands of Palestinians marched to Gaza’s border with Israel on Friday in the largest such demonstration in recent memory, and 15 were killed by Israeli fire on the first day of what Hamas organizers said will be six weeks of daily protests against a stifling border blockade. It was the bloodiest day in Gaza since the 2014 cross-border war between Israel and Hamas. Fourteen of the marchers were killed and more than 750 wounded by Israeli fire in clashes along the border fence, the Palestinian Health Ministry said. Another Palestinian was killed earlier Friday. The large turnout of the flag-waving marchers in the dangerous border zone was a testament to Hamas’ organizing skills, but it also signaled desperation among Gaza residents after a decade-old border closure. Life in the coastal strip has deteriorated further in recent months, with rising unemployment, grinding poverty and daily blackouts that last for hours. The history student said she is a descendant of refugees from what is now Israel’s southern Negev Desert. She said her grandfathers had lived in tents as refugees. “I want to tell the world that the cause of our grandfathers is not dead,” she added. He had brought his family to a protest tent camp near Gaza City — one of five set up several hundred meters from the border fence — where he distributed water bottles to women and children sitting on a mat. Israel also used a new means of crowd control Friday — small drones that each dropped several tear gas canisters on protesters below. People quickly scattered when they saw the drones approaching. The U.N. Security Council held an emergency meeting late Friday to discuss the situation in Gaza. Secretary-General Antonio Guterres called for “an independent and transparent investigation” into the deadly clashes and council members urged restraint on both sides. Friday’s high death toll and prospects of daily protests in coming weeks have raised concerns about another escalation along the volatile frontier. Israel and the Islamic militant Hamas have fought three cross-border wars in recent years. The protest campaign is meant to spotlight Palestinian demands for a “right of return” to what is now Israel. A large majority of Gaza’s 2 million people are descendants of Palestinians who fled or were driven from their homes in the 1948 Mideast war over Israel’s creation. The 70th anniversary of the establishment of Israel, on May 15, is marked by Palestinians as their “nakba,” or catastrophe, when hundreds of thousands were uprooted. The latest Egyptian-led reconciliation efforts collapsed earlier this month, when a bomb targeted but missed Abbas’ prime minister and intelligence chief during a visit to Gaza. However, such plans appeared to be linked to a deal on Abbas taking charge in Gaza, and Israel didn’t say what it would do if such an arrangement didn’t work out. Friday’s violence began before dawn when a 27-year-old farmer picking parsley in his field was hit by an Israeli tank shell in southern Gaza, the Health Ministry said. Another farmer was injured by shrapnel. Israel’s military said troops directed tank fire toward suspicious figures on the border. Later in the day, mosque loudspeakers urged Gaza residents to head to the border encampments. A Hamas-linked bus company ferried protesters to the area. In all, tens of thousands gathered at the encampments, though not all headed to the border, witnesses said. Other Palestinian factions also participated in organizing the protests. The Health Ministry said at least 1,000 people were injured, including 758 by live fire and the rest by rubber bullets and tear gas. Hamas spokesman Fawzi Barhoum praised the turnout. “The large crowds … reflect the Palestinian people’s determination to achieve the right of return and break the siege and no force can stop this right,” he said. Groups of marchers threw stones at Israeli soldiers who responded with live fire, tear gas and rubber bullets. The military said thousands participated in the clashes. The army said Israeli soldiers opened fire at two Palestinians who approached the fence and shot at soldiers in northern Gaza. It said troops also fired on Palestinians who had infiltrated into Israel. The military had doubled its standard troop level along the border, deploying snipers, special forces and paramilitary border police units, which specialize in riot control. Friday’s protest campaign began as Jews prepared to mark Passover, and it is scheduled to culminate with the start of Ramadan, the Muslim holy month, in mid-May. The anniversary of Israel’s founding will be particularly fraught for Palestinians this year. The administration of U.S. President Donald Trump has pledged to move its embassy in Israel from Tel Aviv to Jerusalem to mark the occasion. The planned embassy move falls in line with Trump’s recognition in December of contested Jerusalem as Israel’s capital, a decision that has infuriated Palestinians who seek the city’s Israeli-annexed eastern sector as a future capital.